Union Ministers Babul Supriyo, Smriti Irani, Dr Mahesh Sharma and Anantkumar Hegde. New Delhi, March 21: Bharatiya Janata Party on Thursday announced the names of 184 candidates for the upcoming Lok Sabha elections 2019 in their First List. Along with Prime Minister Narendra Modi and party president Amit Shah, there were several other prominent union Minister cited in the list. Union Home Minister Rajnath Singh will contest from Lucknow seat again this time, while the party has retained faith on Union Minister Nitin Gadkari for Nagpur constituency. Among the other prominent Union Minister who were given party ticket include – Dr Jitendra Singh (Udhampur), Kiren Rijiju (Arunachal West), Alphonse Kannanthana (Ernakulaum), Jual Oram (Sundargarh-ST), Pon Radhakrisnan (Kanyakumari) and Col. Rajyavardhan Singh Rathore (Jaipur Rural). Lok Sabha Elections 2019: Smriti Irani Named in 1st BJP List of Candidates, Set to Contest Against Rahul Gandhi From Amethi. The party has also given tickets to Union Ministers who were in controversy in the last five years of BJP government. 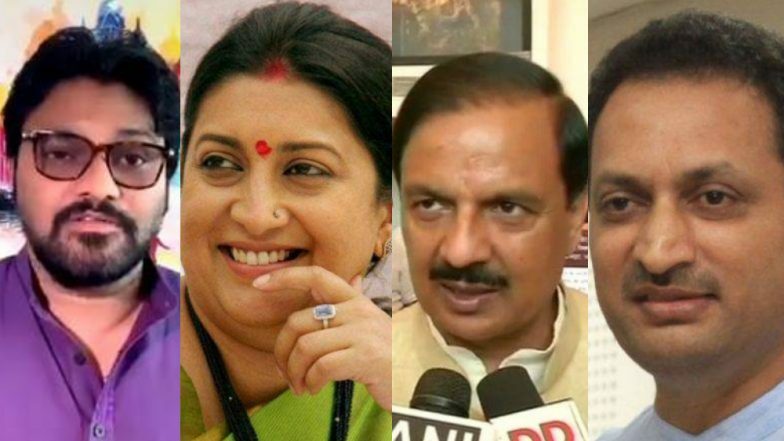 Topping the charts are – Smriti Irani (Amethi), Arjun Ram Meghwal (Bikaner), Anantkumar Hegde (Uttara Kannada), Dr Satya Pal Singh (Baghpat), Dr Mahesh Sharma (Gautam Buddha Nagar) and Babul Supriyo (Asansol). Unlike Congress, BJP released the list of 184 candidates as a whole and said that list for 17 candidates for Bihar would be declared in a joint press conference meeting with alliance Janata Dal United in coming days. However, Congress have so far revealed their aspirants from a total of 146 constituencies.